Tahitian is rated 4.5 out of 5 by 74. Rated 3 out of 5 by WDF from Not as good as it used to be It is very difficult to access the chemical containers, and we have not yet been able to get the water clear after nearly two months. We are disappointed, as we has excellent results and ease of use of our first Caldera spa that we bought eight years ago. Rated 2 out of 5 by mikey007 from Design Shortcomings Tahitian spa is difficult to enter - there are no flat surfaces near the steps to put your foot down on - definitely need to be holding onto something when entering. (Too many ups and downs on the sitting surfaces.) The cover over the filters is easily broken and you must warn off all visitors from sitting nearby. For that matter, there is really no place for a person to sit up, outside the water just sticking their legs or feet into the water. Draining the spa is not a neat process - water leaks out from the spigot-hose connection and the men at the local storeroom said there was not much you could do about it. 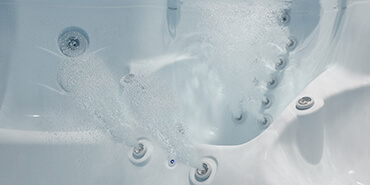 Rated 1 out of 5 by Emmadunkirk from Continue to be dissatisfied with Tahitian My original complaint with the Tahitian was the water volume being so low, in comparison to other spas, that it is very difficult to keep clean and sanitized. Having had a much larger spa before with larger filters, sanitization was never a problem. I decided to try to sell the spa and get another but the outer panels cracked. Caldera was aware and promised to replace the panels. Well that was December 2014 and it is now July 2015 and no new panels. Not much chance of selling a spa with broken panels. I cannot recommend this spa or Caldera customer service to anyone. Rated 5 out of 5 by P&M111101 from We love the Tahitian! 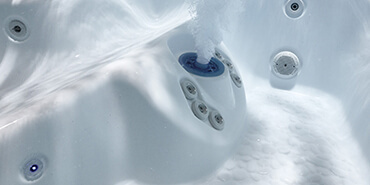 It is the perfect size and has all the amenities of much larger spas. Ours is in use almost every day, either post-workout or just to provide a nice place to relax. Rated 5 out of 5 by Fdkfenn from Great Choice This was a great choice for my family of 5. We use it 3-4 days a week. Gives us time to have family time. 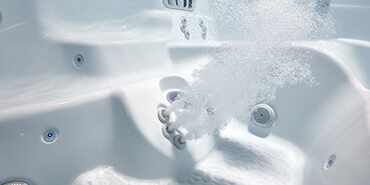 Rated 5 out of 5 by JohnL from Easy Comfort This is our 2nd Hot Tub (first being a competitor) and am very pleased with the ease of care and overall tub configuration. Rated 5 out of 5 by Dan H from Perfect We have used the Tahitian spa for nearly one year now right through our Northeast winter. The Tahitian is perfect for fun and therapy. We have found it to be very energy efficient and easy to take care of. Rated 5 out of 5 by HandyDan from Super Satisfaction The wife had wanted a hot tub for years, and finally we decided it was time. Wish she had been more insistant years ago! Our hot tub is great! Purchased it four months ago, and have been in it almost every day since, (except those rainy and windy times). Being in our 50's and 60's, we highly recommend using a hot tub to relax those tired muscles and spend some good quality time together. Rated 5 out of 5 by Greg from Ultimate in relaxation and relief We have enjoyed hot tubbing for years, but our Caldera Spa is by far the most enjoyable, relaxing and theraputic of any we had ever enjoyed. 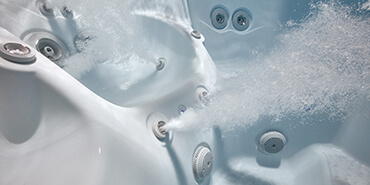 Maintanence with the Spa Frog system is as easy as it gets. This spa has become the centerpiece of our get togethers. Rated 5 out of 5 by bubbles from Best investment we've made! LOVE our spa, we so look forward to our relaxation in the evenings. My husband loves the lounge part, and my favorite seat is the neck jets seat. It is pure heaven and I have a hard time getting out, because I am so relaxed. I love the fact that it is so easy to maintain. We use the once a week aqua Finese system. Just pour in 6 ounces and check chlorine levels. Couldn't be easier! Rated 5 out of 5 by sjm64 from Love the Tahitian We've been enjoying the Tahitian spa - the jets are very powerful and spa has been trouble-free. We looked at several other options and although the Tahitian was expensive, we are not disappointed in the quality and reliability so far. Rated 5 out of 5 by L&M from Love it! Comfort and relaxation a few feet from your back door!! Rated 5 out of 5 by MEC from Wonderful and Relaxing We've had our Caldera hot tub for almost a year now and have enjoyed every minute of it. It is housed inside a sun room, so we get the pleasure of using it all year long. It is so soothing for muscle fatigue and relieving stress. Keeping the water temperature cool in the summer heat has been great. We have thoroughly enjoyed having it. Thanks! Rated 5 out of 5 by Butterflies from Fantastic Medical Relief for Fybromyalgia, Spasms & Arthritis I suffer with Fybromyalgia muscle spasms and pain 24/7! My spa is approved by the Arthritis Foundation and meets all of my needs. It is easy to maintain, runs extremely quiet and the jets are in all the right places to relax the muscle spasms. It is large and deep enough for me to do minor physical therapy exercises to help strengthen my muscles to reduce the spasms. Temperature settings are fantastic and the lights are soothing. I enjoy being able to use it all 12 months every year. Having an immune disorder prevents me from going to a gym or club and having the spa at my home I am able to use it as I need too 24/7. My medical needs are met with my spa. The chemicals are not harsh or damaging to me or to the spa. I am thankful to have what I need provided by a local company that carries these spas. Rated 5 out of 5 by bobby from The Best This spa was a big investment for us. We bought it one year ago and we are delighted with it. Little maintenance and tons of enjoyment. Even the grandchildren love it. It continues to be a pleasure each time we lower ourselves into the crystal clear water. We just love it. Rated 5 out of 5 by kjgy7jgfrt from Very pleased We couldn't be happier with the investment we made in this wonderful addition to our home. Rated 5 out of 5 by LMT888 from I love my Tahitian Spa I purchased a Tahitian Spa 2 and 1/2 years ago. I added an indoor spa room for it and use it every night I am home. I did a lot of research before I chose this model. It has the highest concentration of jets, 2 pumps, and all of the bells and whistles I wanted (changing color lights, waterfall etc.) The lounge chair seat fits me perfectly so I do not float out like some of the larger models. There are also two other great corner chairs (one with neck jets) that are both great too. There are so many alternatives for jet and pressure control that you can find your ideal pressure. The model I have has the California energy efficency standards and runs very efficiently and since it is indoors there is very little difference to my electric bill. Since I do have the spa indoors I use bromine versus chlorine - the good news is that is does not leave a chlorine smell in my house - the down side is that it requires more diligence and attention than the chlorine to keep the water balanced properly. Overall, after two full year of use on an almost nightly basis, I still love it and even with all of that use, have not had a single service issue or problem. it is easy to drain and refill. It is worth every penny to get the spa you really want.and I would highly recommend the Tahitian - it is just the right size (not too big or small) and has every feature you could want. Rated 4 out of 5 by Marygold from We love it We have been using our spa for a year now and we love it. Rated 4 out of 5 by Spider from Spa Review Purchased to replace a other brand spa we have had for 15 years. Does what it is supposed to do, is comfortable and jets properly placed. The waterfall needs to have its own pump for greater energy efficiency since it is tied to jets you would not mainly use. Rated 4 out of 5 by Taglong5 from Only wish I had bought it Sooner! We thought about purchasing a spa for years and since we received our Tahitian, my only regret is that I waited so many years to buy it. Our entire family loves spending some time in the spa. Our kids even tried to play Marco-Polo, which was humorous to watch them figure out the flaw in their plan. It's a high quality Spa that I would buy again in a heartbeat. Rated 4 out of 5 by Paa12556 from Love my tub says it all, well, most if it. The frog system, though designed to eliminate work, does not keep the water as crystal clear as my old spa. Very difficult to keep the pH balanced. As far as comfort, strength of jets, overall features...all great! Rated 4 out of 5 by Jayw from Love my Tahitian hot tub, hate the cracked panel problem I love my Tahitian hot tub but for the last three years that I've owned it, I've been dealing with cracked panels. It's always the same two panels, (the two that are exposed to the most sunlight), as soon as we replace them, they begin cracking within weeks. (I believe we are now on our third set). This time it was all of 5 weeks since replacement and one panel started to bow along the edge to the point where it broke lose from where the screw was placed. Four days later the other recently replaced panel developed a crack. The dealer, Coastal Hot Springs, has been great, although not real speedy when it comes to replacement, (although I'm sure much of this lack of speed has been due to ordering the panels). They have recognized their lack of speed issue by continuing to honor the warranty that was only in place for 2 years from the purchase date, (I believe I've had the spa for 3 years at this point). While Coastal/Caldera has been great with replacement, we really need to get down to the root of the issues. (I'm tired of putting a band-aid on a compound fracture only to find my leg is still broken)! If it wasn't for the cracked panel issue, I'd be able to give 5 stars across the board. Rated 4 out of 5 by deeralayerbbd from family hot tub We have a family if four that use the tub. It has many "cool" features (colors/fountain,etc.). We love it!! The only negative I can say is that the nozzle heads w kids can come off easily. Overall an awesome hot tub. Rated 4 out of 5 by Jhc from Good purchase As a first-time hot tub owner we have enjoyed the Tahitian hot tub year round It has been easy to maintain and ready for use whenever we desired. One recommended improvement would be to have a flat surface to step on when you first enter the tub. 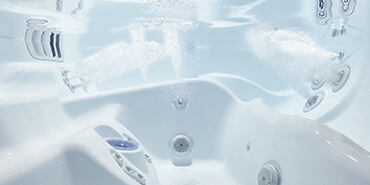 Rated 4 out of 5 by Rocky Mountain High from Nice tub overall Great Hot Tub! All The Bells and Whistles and still covers all the basic needs for a therapeutic and relaxing experience. All positive, except for problems with repeat cracking of the side panels, which have so far been covered under the cabinet warranty. Would have been a 5 out of 5 except for this issue. Would still recommend this tub. Rated 4 out of 5 by DQ from Owned it two years and it has been very dependable We purchased this spa and while I do not like working with our dealership the product is excellent. We did not wet test. I would definitely insist on a wet test as the lounges we were positive we wanted are to deep for us and we float right out. Would have went with a different seating configuration. The Tahitian is reliable and with only two persons using the spa most of the time I find the water easy to manage. The temperature does not fluctuate and the jets perform as they should. Rated 4 out of 5 by Emmadunkirk from Tahitian's smaller water volume makes water care difficult Note before you buy the Tahitian (only 36" deep with 360 gallons) it's lower profile and water volume make water care difficult. It dirties, clouds and foams easily with daily scrubbing of the scum off the sides. Also needs refilling frequently as water volume recedes quickly after a couple of uses. Frog system doesn't seem to work and I am constantly having to add sanitizer (and many other chemicals to keep it clean). I didn't have this problem with my last, much larger, hot tub. I really wanted a smaller spa and thought the Tahitian was a perfect fit but I was wrong and regret not buying the larger Geneva. Finally, I purchased this spa June 30, 2014 to take advantage of Caldera's rebate $750.00 but as of today Sept 4, 2014 I have yet to receive it. Rated 4 out of 5 by Cryt from Tahitian spa Love our hot tub! Very relaxing. 6 person seating, however can only fit 4 comfortably. Rated 4 out of 5 by ECM from This spa is recommended by the Authriitis Foundation. This spa was provided through the insurer of my past employer due to an accident at work that has left me with many medical problems that I will live with the rest of my life. The spa is very comfortable and easy to care for. Due to my immune system and the need to be able to have the access to the spa 24/7 makes it safer for me and easier for me when I need to be in it to relieve the pain I suffer with. However, the increase in my electrical bill was totally unexpected and has added an expense that makes it hard to meet every month. Rated 4 out of 5 by rbm727 from good spa Good spa. Last spa was a hot springs. The Caldera is difficult to clean, leaving 5-6 gallons of water in the base. Also tremendous amount of scale formation. Never once experienced this with my Hot Springs over 13 years. Rated 3 out of 5 by Maxkatsue from Leaking badly and only 2 years old!! We purchased and had a Tahitian 2015 installed in May 2015. We have been using the tub nightly and really enjoyed it until tonight. While using the hot tub, it began to leak and now I have 1 inch or more of water on my screen porch floor. Clearly it is leaking and I have no idea where, but wherever it is, it is a bit early in the life of the spa for a leak. We are very disappointed with this and will need to get the company that services the spa out to fix this. I will also be calling Caldera tomorrow morning to address this issue as well. Very disappointing, but hopefully they will make good on the product. We purchased it because of the reputation of Caldera, so we have expectations of the company to stand by their product. Rated 3 out of 5 by Spa Soaker from Everything I wanted but not more Where the Tahitian looks beautiful, is extremely comfortable, and has great massaging capabilities. It is however, less than expected. I have found the water care to be a little on the stressful side. On another note, Even when the cover is on the spa, I seem to be loosing more water then I am adding. (No its not a leak). Rated 5 out of 5 by Southern gentleman from Great investment! Should have bought one years earlier We bought ourTahitian spa in May 2016. We have used this spa about 90% of the time since we bought it. This spa is so easy to maintain, I just follow the maintenance as suggested in the owners manual and have had no problems with the chemicals. The best part is the time my wife and I spend together in this spa. We both noticed by the third night of use that we were both were not stiff when we woke up in the morning. I have a job where I stand 10 to 13 hours a day and I can't wait to get in the spa after work each day. I shopped about 10 brands before deciding on this model and I am sure this company makes the highest quality product. My electric costs have increased by about $14 a month. We both fell this is much lower than we expected and well worth the price. Rated 5 out of 5 by Charles from Great spa What a great spa. The jets are strong and it's so comfortable. Rated 5 out of 5 by 48machinerulz from Great to relax in anytime of the year !! We have enjoyed our Tahaitian hot tub since last November!! It's been great, We love spending time together in it. The kids can't get enough of it and splash like crazy sometimes too. They love the color of the lights and the waterfall a lot. The tub looks to be very well constructed and sturdy workmanship and fit and finish seems very good also. Rated 5 out of 5 by FCD from I love my Tahitian Spa I bought the spa a little over a year ago and I love the features and ease of use. So far it has met my expectations and I enjoy the variety of stations and jets that work on several areas of your aches and pains. Great quality product, the only issue was two of the speakers went bad which they replaced under warranty with no hassle. I recommend this product based on the price and quality. Rated 5 out of 5 by SuperJimi10 from Caldera Tahitian, a perfect fit for me I got my Caldera hot tub a bit more than a year ago and it still looks like new. The finish is wonderful and it's been a great compliment to my patio. This replaced a Sundance Spa that I bought about 15 years ago. Prices have really gone up over the years, but so have features. The integrated Bluetooth sound system is excellent, control panel is very nice, as is the lighting package. The exterior material and the tub shell are both ultra durable. Maintenance has been easy and the water has stayed clean and fresh over the past year with very little effort on my part. Filtration system works like a charm. What a great hot tub! Rated 5 out of 5 by JoeD from Why did we wait so long??? We looked into purchasing a spa for a couple of years, but in earnest in Jan. 2016. With one of us having a horrible back and the other trouble with just about every joint...we figured it would give us some relief. Got our Tahitian installed June 6th and have used it just about every day since and we can't figure out what took us so long to buy one! We've finally gotten used to the water care regimen and it's been the most relaxing and therapeutic experience that we could imagine. We would recommend Caldera to any one who asked. Our dealer has been very supportive and informative during our learning curve. Rated 5 out of 5 by Darby105 from We love our Spa Beautiful addition to our home. Thoroughly recommend Caldera. Rated 5 out of 5 by 333333333333333 from #LOVINGTHEBUBBLES I purchased a Caldera Spa for Christmas. I have been wanting my own spa for so long and now that I finally have it to enjoy, I cant say enough about it. Everything about it is wonderful (maybe except the water treatment care). But its been truly a wonderful addition to my relaxation therapy. I was able to get an end of year close out sale at my local spa dealer and I also included some accessories to my purchase. I love the Bluetooth music addition. Makes the entire experience that much more like a mini vacation each time I use the spa. Rated 5 out of 5 by Tripledhome from Love Tahitian Perfect one on one time with my wife. Very relaxing and peaceful. Rated 5 out of 5 by jq from use it every day we get in our tub everyday. even if it is raining. we love it. Rated 5 out of 5 by Barbara53 from Utopia Tahitian Love it! Love it! Love it! We use it in the early morning to enjoy coffee and the birds chorus to begin our day. We use it at night to wind down the day and relax with a glass of wine. Best purchase ever. Get the auto lift cover, because that makes opening & closing very easy. It's worth the cost. Rated 5 out of 5 by JAFDAF from Wish we would have done it sooner Absolutely a wonderful investment, The Tahitian has surpassed our expectations and we look forward to many years of trouble free use. Rated 5 out of 5 by Goodmeasure from Sharing We have found two specific and wonderful uses for our spa. The first is what it allows for my husband and me. We do not care for super hot temperatures in the tub so we turn on the music, jets and lights and sit in the tub for an hour, until the jet's timer turns them off. We take turns relaxing and taking in the massage benefits in each area and have each other as a captive audience. 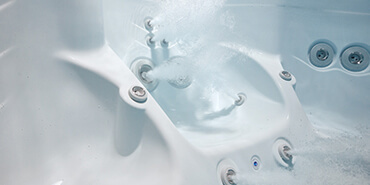 The second use allows us to share the tub with our married children in that they as a couple go use the hot tub while we benefit from one-on-one time with our grandchildren. We have offered this to friends with young children as well and it is a joy to get to share this wonderful, relaxing experience with them and get to know and care for their little ones. We LOVE our Caldera Spa and hope to enjoy it and share it for many more years! Rated 5 out of 5 by Cruising in Texas from Part of my "get healthy" routine We purchased the Tahitian less than a year ago as an addition to our remodeled backyard. I had never owned a spa before but wanted it for entertainment. What I have managed to do is add spa time in as part of my weekly routine to unwind after workouts as well as just relaxing in the evening. The spa design is perfect for my use since it allows me to pick the right station with the right jets depending on what part of the body needs a good water massage. I seem to sleep better after spa time and this has improved my overall health. I recommend the Natural products for the hot tub. They seem to be easier on my skin. I love my hot tub! Rated 5 out of 5 by Pam32 from Lovin' it! I have enjoyed relaxing in my spa for years! It's very comfortable and easy to use and care for! Rated 5 out of 5 by JEFFR7772 from excellent You feel refreshed in new after 20 minutes before retiring to bed. In the morning when you wake up.....you KNOW if you enjoyed your SPA!!!! Good times!!! REFRESHING and AFFORDABLE!!! Rated 5 out of 5 by Tom from Tahitian Review I am very pleased with my purchase. It does use up alot of energy to keep it running through the winter in new england, but Im sure that goes for any hot tub. I would definitely recommend this hot tub and this brand. Rated 5 out of 5 by GINurse66 from Love it! We love our hot tub! It is so nice to soak in especially in the winter. Snow on the ground, stars in the sky, glass of wine.......priceless! Rated 5 out of 5 by PeterV from Great Value Many great features We have been had spas for many years, owning many premium brand spas. This is our first Caldera Spa and could not be happier with the value and features of our Tahitian. The Spa is built into our deck. The blue tooth music system is great. The speakers are placed so they can be heard even with the spa jets turned on; and the motors are well insulated for sound, this is the most quite spa we've ever owned. My only complaint is concerning the Frog filter system, the water does not circulate well throughout the filter and mold developed within the lines which is very difficult to clear. Rated 5 out of 5 by Shay from Best Idea Ever ! I owned an above ground swimming pool for 25 yrs. but when i built my new home I decided to go with a hot tub. Living in New England I was only able to utilize my swimming pool 3 months of the year, but having a hot tub i can enjoy it all year long. After weeks of research , i decided to go with the Caldera Tahitian model, because it fits my needs. There is more than enough room for six people and Everyone is comfortable. I can't express how much Joy this hot tub has brought our Family. It serves many purposes.....the most important being spending quality time as a Family. Every Sunday we spend time together in the hot tub sharing stories . It's Wonderful. Also, I am a Registered Nurse and my job can be very taxing. Not only does this hot tub relieve the aches and pains i often incur, but it relieves my stress. Caldera has been a Fantastic company to deal with. Anytime that I called them with an issue they resolved it without any warranty issues. A company that stands behind their product is very important to me and Caldera does just that. Rated 5 out of 5 by USAF73 from Excellent tub Purchased the tub three years ago. I am a vet with spinal issues. This tub has been a blessing. Great, powerful jets, easy to maintain. Highly recommend this tub and caldera. Rated 5 out of 5 by MaxHawksbeard from Great tub Great tub for our family of six. Easy to maintain and very relaxing. Lighting adds a variety of effects to the tub. Overturning waterfall knob too far by kids resulted in loose fitting but it still works. We keep it at 99 degrees in summer and 103 in winter. Rated 5 out of 5 by goodmeasure from Best retirement gift ever!! We purchased our hot tub about 2 years ago after my husband retired. It has been an excellent asset to us for our Staycations, allowing us to simply relax with a beer and great music of our choice. We sometimes talk....sometimes not. And that is alright!! Rated 5 out of 5 by Brenda from Money well spent This spa had all the features that I was looking for - comfort, different positions, strong hydro massage, ease to take care of. The sales person did not over inflate the features when presenting to me. I'm enjoying and use all the features, and amazingly, there is rarely a day that I don't use my spa. It has been instrumental in addressing muscle issues that I have been experiencing for some years. Rated 5 out of 5 by dom67 from tahitian Perfect sized spa and nice controls. Lots of jet features and the lounge feature is terrific. Rated 5 out of 5 by Lisa from Love it!! Relaxing, healing for my back! Best investment we made! Rated 5 out of 5 by Bron from Very Pleased Extremly pleased with it. Have had it for six months. Couldn't be happier with it. Rated 5 out of 5 by Jilld50 from We love our Caldera Spa We use it almost every day! love it can't say enough about it. Rated 5 out of 5 by Rabbit from We love our SPA Excellent SPA. Great service on hook up with great, knowledgeable sales. First time spa owner here and after checking around we really came to understand you get what you pay for. We are looking forward to years of enjoyment. Rated 5 out of 5 by BB from Pure Heaven ! I love my spa it has all the features you need in a hottub. The cabinet is not only sleek looking but is durable to the elements. I spent many days reviewing hot tubs, I chose Caldera because they back up there product and they had the least amount of bad reviews . Thank you Caldera for engineering such a great line of hot tubs . Rated 5 out of 5 by Alisa12 from Great product great value We love our new spa, and it brings joy and life to our family. I am so happy we decided to go to the hot tub store in Vacaville. Our sales person really took care of our needs and helped us find the right product to fit our budget. I recommend calderaspas to anyone looking for a great spa that will last for many years. Rated 5 out of 5 by Tim from Tahitian review This is our first spa and we couldn't be happier with the product. It is comfortable and of the highest quality. We would recommend this spa to future spa owners. Rated 5 out of 5 by TracyM from Love Our Tahitian We purchased our Tahitian in Aug 2016 after a few years of research and mulling over this purchase. We did a wet test and finally decided on a Caldera. It was the best purchase we have ever made. It was wonderful in the late summer/fall time in Michigan but when we got our first snow I told my husband there was no way we were going in there during the cold. My neighbor (who also has a spa) said to just try it. We have been in it every week since. Water care is pretty easy. As long as the water is super clear I don't get too crazy about the readings. It is a lot lower maintenance than I imagined, especially with the Bromine. Rated 5 out of 5 by Roger from Tahitian Spa I have had my Caldera 4 months now. The energy cost is minimal. I first used the Bromine cartridge and the chemicals were easy to maintain. I switched to the Chlorine cartridge and can not get the Free Chlorine levels up. When I change the water this month I will go back to the Bromine cartridge. Otherwise I am very happy with this purchase.